Toy2R is celebrating their 15th anniversary of the Qee figure. As part of the year celebration, Spaghetti Project was asked to host a custom Qee show. 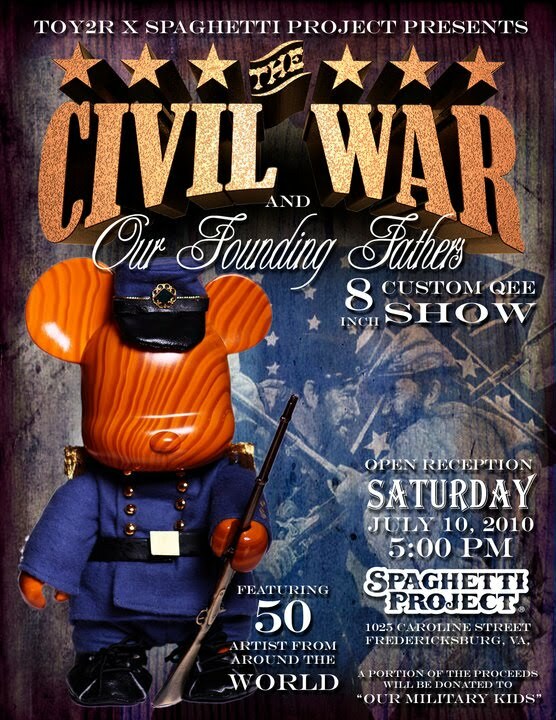 This show will feature customized 8 inch Qee figures from 44 artists in theme of "The Civil War and Our Founding Fathers"
Stated Purpose: "to ensure that the children of deployed and severely injured Reserve and National Guard personnel can afford to participate in activities such as youth sports, fine arts and tutoring programs that are so important in their young lives during this stressful time." Opening reception will take place on Saturday, July 10th from 5-11pm with some artists in attendance. The exhibit will open on Friday July 2nd and be on display through July 31st.